These bars are going for $9.95. Avocado toast is kind of like that Instagram model you love to hate: It’s trendy, it’s all over your social feeds and it looks good wherever, whenever. 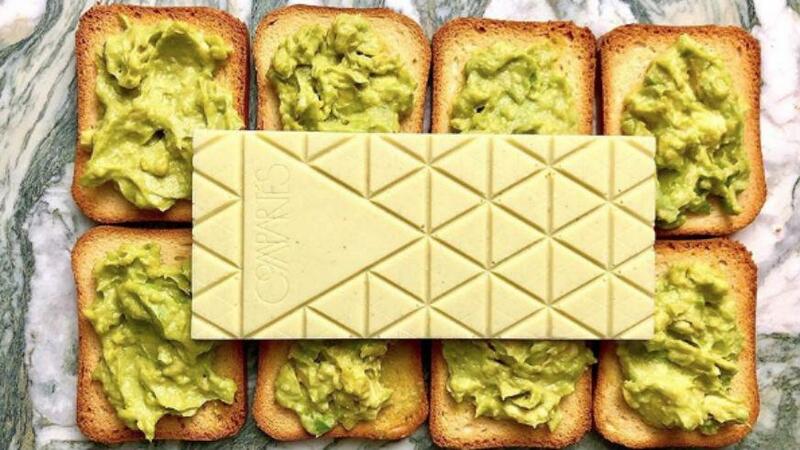 And now, you can spend all your house down payment money on an avocado toast chocolate bar created by Los Angeles-based Compartes Chocolatier. [post_ads]This brunch-inspired avocado toast chocolate bar is made from smashed avocados, crunchy toast and creamy white chocolate. And, according to a recent Instagram post from the gourmet chocolate shop, the limited-edition bar is going fast. On Compartes Chocolatier’s website, the bar is described as "an avocado enthusiast's dream." "The most trendy food of 2018 gets a chocolate dipped makeover," it states. "Creamy white chocolate blended with premium California avocados and crunchy bits of caramelized toast create a crunchy, sweet unique chocolate sensation unlike anything you've ever tried before!" The wrapping has a fun design, and the bar itself — which reportedly takes two days to make — has the signature Compartes print. Owner Jonathan Grahm told Insider that they blend avocados with white chocolate because "avocado really doesn’t have a super strong flavor. … If you put it with milk or dark [chocolate] it would almost get lost." "You could see the green coming through in the chocolate bar," Grahm continued. "And then you get that crunchy bit of toast, that hit of sea salt — and again, it’s breakfast, lunch and dinner." A Compartes Chocolatier spokesperson told Metro that the bar will only run through avocado season (California's avocado season usually lasts into September). But, how does this avocado toast chocolate bar from Compartes Chocolatier taste? The same spokesperson said people "have been loving" the avocado toast chocolate bar. "The bars are selling like crazy and customers are already coming back in for more bars after buying [them] for the first time!" An Insider producer said the toast makes it feel like a crunch bar — and she raved about how good it tastes. One Instagram user commented on a recent post, "I really wanted it to be great, but it doesn't taste like avocado at all." Another said the avocado toast chocolate bar was disappointing. Taste test it yourself if you’re curious. If an avocado toast chocolate bar doesn’t seem like your thing, you can always grab a pint of avocado ice cream or scavenge for an avocado Frappuccino from Starbucks. But, if you want to try it out, it’s being sold on the Compartes Chocolatier website for $9.95. Not an avocado fan? (*Gasp*) You can try their potato chip or Donuts & Coffee chocolate bars. Or, order their birthday cake bar because every day should feel like a celebration.